Review Summary: CHASE lacks face-value as well as merits. Besides with an opposition like HOUSE FULL CHASE stands no chance. Nurses roam around mental health institutions in micro-mini uniforms, the camera watching as they bend down to pick up something. CHASE lacks face-value as well as merits. Besides with an opposition like HOUSE FULL CHASE stands no chance. 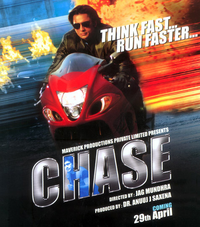 If the title 'Chase' has you expecting an edge of the seat thriller then better brace yourself. A better title might be................ Forget it.